No one could pronounce the word "sophomore" better than this man. Without him, there's no "Grandaddy of them all". No "Whoa Nelly!". And of course, no "Big House". So many words have been written and spoken about Keith Jackson's legacy and influence in not only sports broadcasting and college football in general over the last couple of days. I can only add my two cents to that conversation. He was the embodiment of class and sportsmanship to an entire generation of fans, players and coaches. I was began my college football fandom in the later stages of Jackson's career, the early 90s. 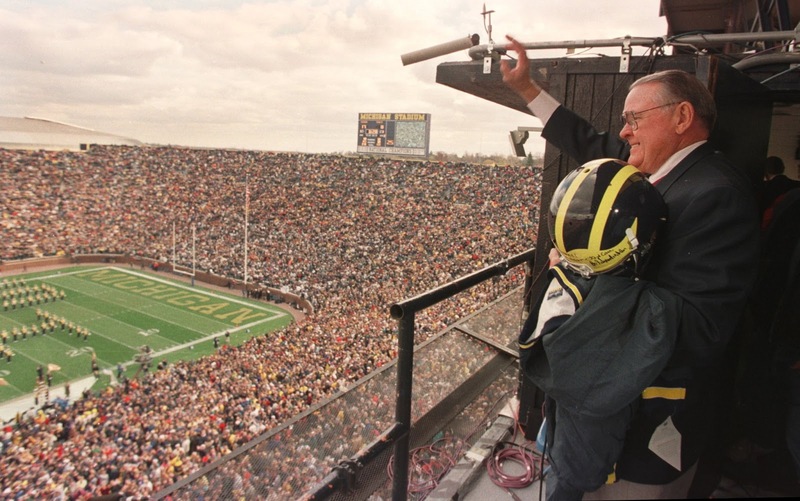 In those days, when Keith Jackson was on the call for your game, it was a special thing. It meant that it was a big game. It meant that for those 3 and a half hours, all eyes (and ears) from around the country would ascend on your favorite team. Back then there were no "primetime games". But there were "Keith Jackson games". Like most Michigan fans, I truly adored Keith Jackson. He was, by default, the unofficial spokesman of the 1997 championship season, calling pretty much every big game on ABC that year...Colorado, Notre Dame, Penn State, Wisconsin, Ohio State and of course, the Rose Bowl. To be a fan of college football in the 80's, 90's and early 00's, meant that you were probably a fan of Keith Jackson. His tone, his anecdotes, his honesty, how he could capture a scene and of course his passion, were all unique to him. No one before or since could call a game the way he could. My personal favorite Keith Jackson moment was after the 1998 Rose Bowl when Brian Griese was named MVP of the game (about 4:30 in this clip). Right in the feels, man.